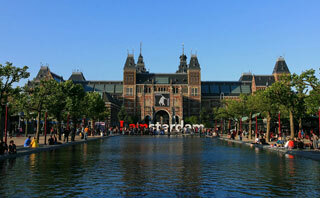 The Rijksmuseum is a Dutch national museum dedicated to arts and history in Amsterdam. The museum has on display 8,000 objects of art and history, from their total collection of 1 million objects from the years 1200-2000, among which are some masterpieces by Rembrandt, Frans Hals, and Johannes Vermeer. This article uses material from the Wikipedia article "Rijksmuseum", which is released under the Creative Commons Attribution-Share-Alike 3.0 License.